Drinking on Purim: A Mitzvah? Image: Two shot glasses full of liquor. Image by saragraphika. This is not a trifling matter. On the one hand, that is a traditional understanding of the command that we celebrate on Purim. But on the other, we now know more about the dangers of over-consumption of alcohol. Jewish tradition both encourages the use of wine for celebration, and encourages moderation in the use of alcohol. Shabbat and holidays are welcomed with a kiddush toast. The Passover seder requires four cups of wine. Many life cycle events include a cup of wine: even the baby receives a taste of wine at his bris! On the other hand, our tradition has warnings against alcohol abuse. Noah shames himself and is shamed by his children for becoming a drunk. A midrash speculates that the sin of Nadav and Abihu, the sons of Aaron, was that they entered the Tabernacle drunk. (Leviticus 10:1-11) A line in Sanhedrin 70a quotes Rabbi Meir as saying that the Tree of Knowledge of Good and Evil was actually a grape vine, because nothing brings so much woe to human beings as wine. In Tractate Megillah 7b, the rabbis focus on the phrase “observe the days as days of feasting and joy.” Exactly how are we to observe it, they wonder? Rabbah and R. Zeira joined together in a Purim feast. They became inebriated, and Rabbah arose and cut R. Zera’s throat. The next day he prayed on his behalf and revived him. This story seems to warn against drunkenness. Two rabbis get drunk together, and one cuts the other’s throat. (The Aramaic is vivid: literally, he shekhts him, ritually slaughters him.) Rabbah prays, and Rabbi Zeira is returned to life. The next year, Rabbah invites R. Zeira to celebrate with him again, and this time R. Zeira demurs with the warning that one cannot depend on miracles. So: is this a story warning in general against drunkenness, or is it a story warning that the “drink a lot on Purim!” interpretation is incorrect? How else might we understand this, if not “drink lots on Purim”? If we take a clue from Jastrow, is there a way to do this by fermenting, by studying until the two statements are one? What if we were to ask, “Are there any ways in which Haman and Mordechai are alike? My initial reaction to this was to laugh, it is such a ridiculous question. One is the bad guy and one is the good guy! They aren’t anything alike! But on second thought, read the book of Esther. If we read it not in its sanitized version we tell children but the way it is written, Mordechai presses Esther to participate in the search for a new queen. This means joining the harem and becoming a one night stand for the king in hopes of securing a permanent position. In other words, Mordechai pimps his own neice, possibly to enhance his own power: not very moral at all. But even more so, in chapter 9 of the book of Esther, Mordechai proves as bloody-minded as Haman. Haman and all his sons are executed on Mordechai’s order, as well as 5,000 Persians, and on the next day another 70,000 are executed. This is at least as many dead people as Haman had ordered. So how different are Haman and Mordechai? There’s a reason we don’t like to read chapter 9. Posted on February 11, 2016 October 26, 2016 Categories PurimTags alcohol, drinking, mitzvah1 Comment on Drinking on Purim: A Mitzvah? Today my cell phone company taught me how to do a mitzvah. Who knew that they could help with mitzvot? My old phone had many bad habits that were getting worse. I asked the customer service rep if I could repair it. I could, Mike said, but that would take two weeks. Can you give up your phone for 14 days? I can’t. I fussed at Mike that I hate buying a new cell phone every two years. It’s wasteful of my money, it’s wasteful of rare minerals, it’s wasteful of the labor to make the phone, and so on. I’m sure poor Mike has heard it all before. Then the miracle happened: Mike informed me that there is another way. Step 1: Buy a used reconditioned phone. Someone sold it back to the company, probably to buy something newer and fancier, and the company fixed it up and slapped a nice warranty on it. Step 2: After I transfer all my contacts and dog photos to the new phone, I can sell the old phone back to the company, presumably to be fixed up and sold again or to be parts for other fixed-up phones. 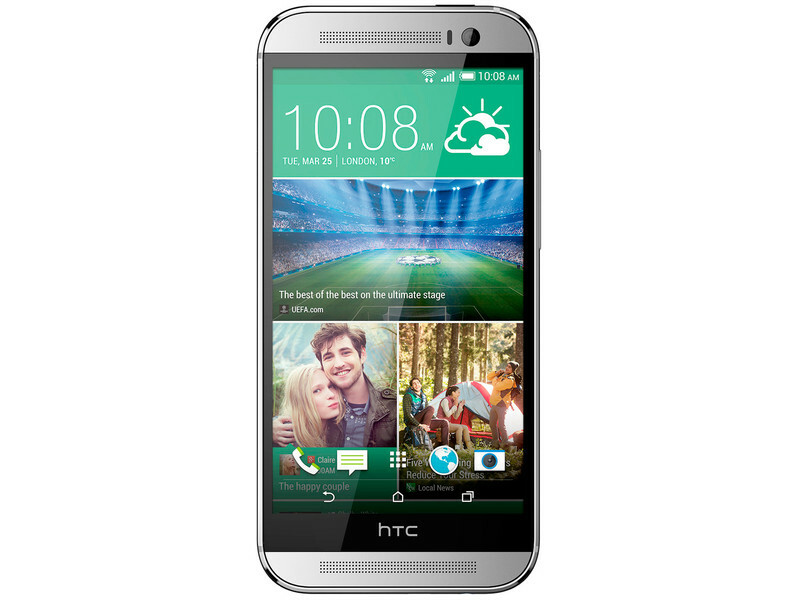 Now I have a smartphone that meets my needs and cost much less. Better yet, it did not use additional scarce materials from worrisome sources. Best of all, I can continue this cycle. If the phone were simply old, not crotchety, I could donate it to a nonprofit and they could use it. Either way, it’s a mitzvah. Our sages determined that the sin in cutting down those trees is waste. They expanded their understanding of those verses to include household waste and today it is a source for talking about the sin of environmental waste. We are stewards of the earth, not owners of it. We must not destroy resources just because it suits us to do so or is convenient. And as for Mike, I thanked him. I don’t know where he is, but I hope he sleeps well tonight, having helped a rabbi do a little mitzvah. It’s never easy to be a Jew. It’s particularly hard to be a Jew on a week like this, when I read about the terror of the Jews of France and the terrible murders in Paris. Even though I am safe in California, the Jews of France are my cousins. I feel this even more sharply right now because I am aware that some of my readers are French Jews. To them I say: Mon cœur et mes prières sont avec vous! My heart and my prayers are with you. When I feel helpless, I resort to something I’ve written about before: living on the Mitzvah Plan. There is little that I can do directly for my cousins in France, but I will not “tune out” because the news is unpleasant. The Mitzvah Plan will keep me aware and centered. The basic idea is this: with 613 mitzvot to choose from, there are always mitzvot waiting to be done, from washing first thing in the morning to saying the bedtime Shema at night. Using the Mitzvah Plan, whenever I begin to be bothered with the thought patterns of fear or depression, I look for the first available mitzvah and do it. Then I look for the next one, and I do that. I keep doing mitzvot until I feel better. I don’t have to think about it, I don’t have to enjoy it, I just need to do a mitzvah. This constant busy-ness with mitzvot keeps me from foolish or evil activities. If I am busy with mitzvot, I can be ready to help the Jews in trouble (with mitzvot!) but my activities will be bound by the commandments regarding speech. I will not engage in negative talk [lashon hara] unless it is truly necessary to protect another from immediate harm. I will not repeat anything about another even if I know it to be true, [rechilut] again unless it is truly necessary to protect someone from immediate harm. I will not listen to or believe lashon hara. That means I will change the subject or move it to safer ground when someone else is speaking lashon hara. So, while I may point out news reports from responsible sources to others (retweet them or post to facebook or email them to another) I will make myself too busy with mitzvot to spread opinion pieces that engage in lashon hara. I will be too busy with mitzvot to engage in conversation that speaks ill of “all Muslims” – for that too is lashon hara. There are mitzvot I can observe that will help. Before Shabbat, I can give tzedakah to organizations that work to assist the Jews in France, Jews in Europe and organizations that fight anti-Semitism. I can send letters of encouragement to friends there, if I know anyone who may be affected. I can engage in the mitzvah of taking challah. I can pray, and feel my Shabbat table connected to the Shabbat tables of Jews who are in trouble or fear. Some reader may be thinking, “That’s not much! Those things won’t make a big difference!” but to them I say, how can you know what difference they will make? And more to the point, if I am busy with mitzvot, I will be too busy to let an evil situation drag me into actions I will regret, and into attitudes I abhor. I will not become part of the problem, which is always a danger. This Shabbat, my table will be larger. Even though there will just be two of us sitting there (one of us has a bad cold, so actual guests are not a good idea this week) we will be thinking of the Jews of France. We will include them in our feast, in hope that some of the peace at our table will be (or will have been) at theirs. May the day come when every person on earth can live in peace, where none will be afraid. 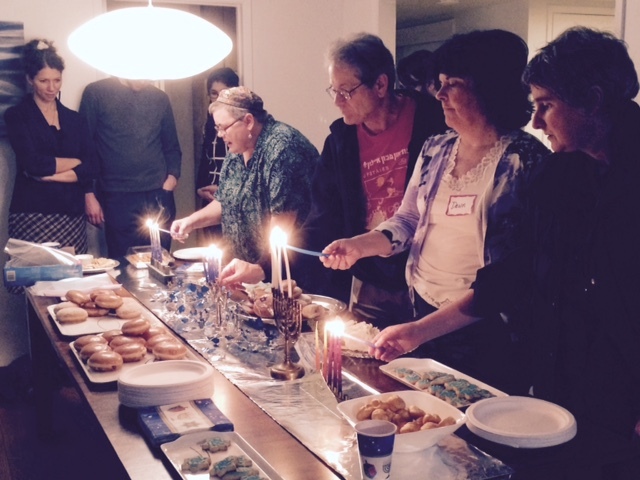 Lighting the candles at our Chanukah party. Long-time readers may remember my Hospitality Challenge: 16 months ago I challenged myself to grow in the mitzvah of hospitality. Yes, it is an actual mitzvah: Abraham and Sarah are famous for their hospitality. The Torah commands us to follow their example. After all, this is how all of us learn to “do Jewish:” not from a class or a book, but from observing the mitzvot with other Jews. What I didn’t expect was that hospitality could also be an avenue for personal and spiritual growth. Here’s where we started: I’m an introvert married to an introvert’s introvert. We are not great housekeepers, nor are we good cooks. We were both intimidated by the idea of opening our home to people who might (eep!) judge us on our housekeeping and cooking. We’ve had fewer Shabbat guests than I originally hoped, but we have hosted more people in the past year than ever before. We have celebrated almost every Jewish holiday with friends and family and some new friends (aka “strangers.”) Sukkot and Chanukah each saw a large gathering at the house. During the summer, I hosted regular Torah study gatherings here, and we’ve had countless folks over for an afternoon or an evening. We’ve had great dinners, and burned dinners, gatherings where we were overrun with guests (who thought they’d all say yes?) and gatherings we canceled for lack of guests. There have been some wonderful people here, and a few who’ve been a challenge. And yet one thing has been constant: after the guests left, there was a glow that remained, a sense that home was indeed a holy place of warmth and friendship. Nobody cares that the rabbi’s desk looks like a tag sale. If the main dish is a bust, the pizza place down the hill delivers. To carry out this mitzvah, I had to learn to ask for and accept help. People will bring food if you ask them to ahead of time. A plan for the evening is nice but not necessary. All guests go home eventually. Jewish warmth and Jewish blessings make everything glow. Jewish hospitality grows our Jewish souls. Taking on this mitzvah has made me grow into a happier person and a better Jew. Here’s to 16 more months (and more!) of sharing the joy. 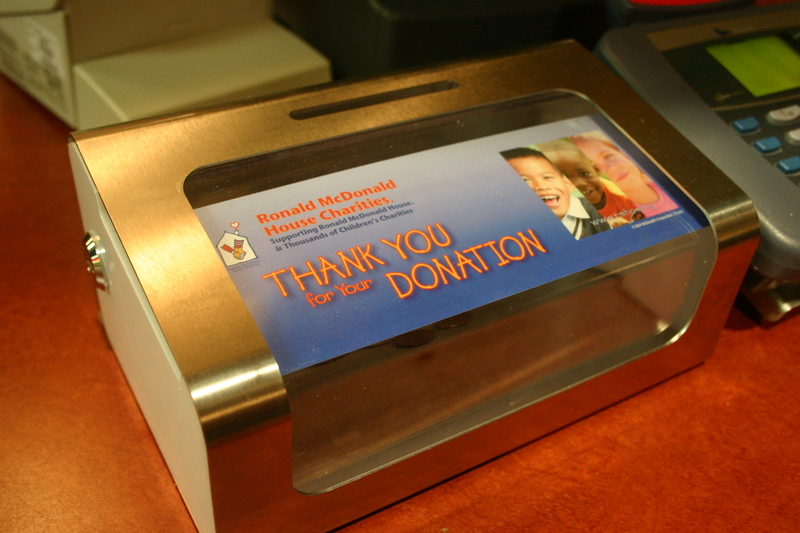 There are many opportunities to give tzedakah. “Giving Tuesday:” It’s a new tradition, started recently, and while I am glad that people are giving charity, it seems to me that the timing is backwards. We have the banquet on Thanksgiving, the shopping on “Black” Friday, the sales over the weekend, and “Cyber” Monday. The message seems to be that after we’ve had our dinner and done our shopping sprees, then we will give to the needy from what’s left. It is a Jewish tradition to give tzedakah (money to relieve suffering – a form of the word for justice, tzedek) before every holiday. That means giving tzedakah on Friday, before Shabbat, and before sundown brings in any other holiday or celebration. You may be thinking, “Ouch! that’s a lot of tzedakah!” but the amount isn’t specified, just the timing. We give before we celebrate. It helps us better appreciate the good things in our lives. For someone on a very limited budget, the amount would be extremely small, since Jewish law forbids us giving more than we can afford, but for the poor person it gives the dignity of knowing that he or she contributed, too. For someone extremely wealthy, giving regularly from a budget for giving is a way to keep wealth in perspective. Disciplined giving keeps us awake and aware of the world around us. We cannot ignore the needy, if we give so regularly (after all, we have to choose where to give!) Since Jewish holidays come at least once a week (think Shabbat,) ideally we give small amounts so regularly that giving becomes a habit, part of our nature. Over a lifetime of tzedakah, the greatest benefit accrues to the giver, because he or she becomes a better person. 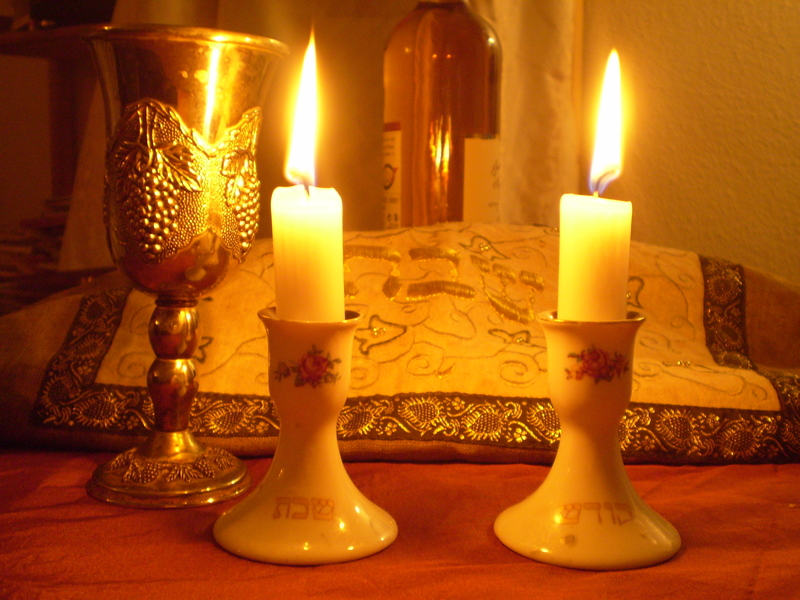 Shabbat arrives every Friday night. Whether or not you give on Giving Tuesday, I invite you to join me in this ancient spiritual practice of regular tzedakah. US Geological Survey photo shows the lava crossing Cemetery Rd and Apa’a St in Pahoa. A few weeks ago, I wrote about the plight of the people of the Lower Puna district in Hawai’i in Suffering is Not a Show. 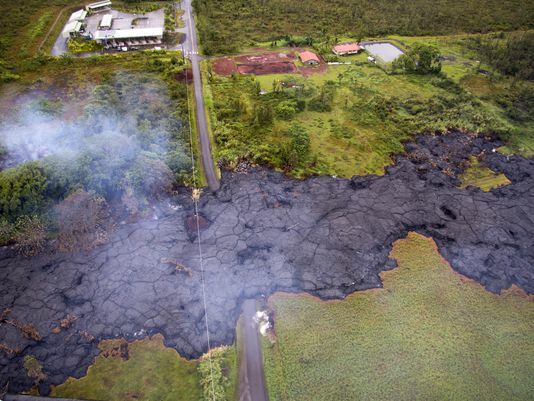 Kilauea volcano’s most recent eruption took an unexpected turn this past summer when lava began oozing toward the homes of the small town of Pahoa. Real estate in Lower Puna is among the cheapest in the Hawaiian islands because of the nearness of Kilauea. It is a gamble to buy land there, because the volcano is so close. On the other hand, if a person of ordinary means and no inheritance wants to own land, that is the only affordable property; much of the rest of the Island belongs to land trusts or owners with very deep pockets. Until June, the village of Pahoa was one of the fortunate places. Then the lava began moving their way, just before the brunt of Hurricane Iselle hit that part of the island. Tzedakah is the Jewish word for money given for the relief of suffering. It is a mitzvah to assist someone in such a situation. The Hawaiian people speak of Madame Pele, the deity of the volcano. They regard her with reverence and awe. As a Jew, I see the awesome power of the volcano. God in nature can indeed be fearful, but as a human being I can perform mitzvot, extending the mercy of God with my helping hand. “What’s a mitzvah?” a reader recently asked. If you look it up in the Hebrew dictionary, it will tell you that a mitzvah is a commandment. “Commandment” in English implies that it comes from outside, and it isn’t my choice. And yet each mitzvah IS a choice: I can keep it, or I can neglect it. It’s up to me. These duties are rooted in Torah, but they are acted out in my life, and in the lives of my fellow Jews. I prefer to think of mitzvot (that’s the plural) as my sacred duties. Whether they are as lofty as saying my prayers, or as mundane as paying workers on time, they increase the holiness in the world, and they are choices I make every moment of every day. I do not get a gold star for doing them. They are just what I do as a Jew. This month I’m asking myself: which of my sacred duties have I neglected? Which have I done poorly, done for ego, done only when someone is looking? Which have I treated as truly sacred? This post is inspired by #BlogElul, the brainchild of Rabbi Phyllis Sommer, also known as @imabima. Posted on August 27, 2014 Categories MitzvotTags 613, commandments, mitzvah, mitzvot, Torah5 Comments on What’s a Mitzvah?